While the governor, the Appropriations Committee and the tax hikers in the Revenue Committee are busy pulling more spending and truck loads of higher taxes through December and into the legislative session, gubernatorial hopeful Mary Throne has taken the opportunity to sharpen her candidate profile. This is no coincidence. Next year's election is going to be an election over taxes, spending and the very economic future of our state. Throne, savvy as she is, knows which way the wind is blowing and wants to establish herself on that arena. There are many reasons to pay attention to what Throne has to say. For one, the Democrat party has fallen in line behind her without so much as a whisper of competition. This means that the Democrats have a year to establish her as Mead's inevitable successor. Another reason to pay close attention to Throne is that the field of likely Republicans is populated by Matt Mead wannabes. Now, don't get me wrong: there is nothing bad in wanting to be like Matt Mead. You could do worse. But you could also do much better. Wanting to be like Matt Mead is like a high school kid who works really hard to get a B. Democratic gubernatorial candidate and former state lawmaker Mary Throne is the only serious candidate to have entered the 2018 race, with Republicans Mark Gordon and Ed Murray yet to announce their plans. What did I tell you about the Republican field...? But since launching her campaign in August, Throne hasn’t really been able to explain what sets her apart. She touts her Wyoming roots and common sense policies like economic diversification, but moderate Republicans like current governor Matt Mead and Gordon can do the same — and Gordon wouldn’t have the baggage of a “D” next to his name on the ballot. Here, Rosenfeld is being much too kind to Mark Gordon (and, by implication, Ed Murray). A more reasonable characterization would be that Gordon's only asset is that he is a Republican. In fact, if I understand the aspirations that Mark Gordon, Ed Murray and Cynthia Cloud have, they all fall so narrowly within the mainstream of the Republican leadership here in Wyoming, that you cannot tell them apart. This reminds me of the GOP gubernatorial lineup in 2010. Maybe Harriet Hageman can spice things up, but as far as I know she is not yet a candidate, even unofficially. All I hear is about efforts to recruit her. But speaking to me at a downtown Casper cafe Thursday, Throne seemed more passionate about what the state is doing wrong: namely, neglecting its cities and towns. Throne has made support for local governments a key platform point and she doubled-down in the interview. She attacked the budget passed in 2016, her last year in the Legislature. Throne specifically criticized the decision to slash social services like tax assistance to the elderly while setting aside funds for a new state office building not too far from Metro Coffee Company where we were speaking before a meet-and-greet with voters. I happen to agree completely on this particular point. The cuts that were made to programs aimed at vulnerable citizens were immoral in themselves (there are much, much better places to make quick cuts in government spending - start with the well-paid school bureaucracy and work your way out) but the politics behind those cuts get downright cynical when those cuts are contrasted against construction projects like the one in Casper. Not to mention the capitol project here in Cheyenne. If Mary Throne uses these kinds of idiotic budget priorities in her campaign, she will definitely be a strong candidate. Her problem is that she also is an avid defender of government in general. Her advocacy for more money to local governments is the same, old, tired and uninformed welfare statism that dyed-in-the-wool liberals always propose. It is neither surprising nor alarming, but it also means that as governor, she would continue to spend money and defend government at all cost. Nobody would expect anything else from a Democrat. The troubling part in this is that the Matt Mead Wannabes, one of which she will be running against, are for the same policy priorities. As we heard last week, Mead himself can't get back fast enough to spending more of our money; his B-student cheerleaders will most certainly follow suit. “State government has to change its attitude toward local governments,” Throne said. “They sort of make them come hat-in-hand to the Legislature and beg for money.” Lawmakers need to recognize that municipalities are important service-delivery providers for state residents and that quality of life in Wyoming communities is a key factor in whether businesses decide to locate or grow here. In 2009 and 2010, when the private sector reduced employment for 19 months in a row, government merrily continued to add employees to its payrolls. Measured July 2008 to July 2010, Wyoming lost 19,400 private-sector jobs; during the same period of time, state and local governments hired 1,200 new workers. For every 1,000 jobs lost in the private sector, government created 63 new ones. When the private sector began rebounding in late 2010, the government hiring streak continued. By the end of 2012, the private sector was still 10,400 jobs short of where it was by the end of 2008. During the same period of time, state and local governments added 2,500 people to their payrolls. Over the next two years, 2013 and 2014, we saw somewhat of a balancing act from government. The private sector continued to do moderately well, adding a total of 7,200 jobs, while the state of Wyoming and our counties, cities, towns and school districts actually cut their payrolls by 1,300 employees. They were still up compared to pre-crisis 2008, while the private sector remained 3,200 jobs short of its 2008 number; still, the break in the hiring streak was welcome. Since the end of 2014, our government entities have continued to walk a thin line between their own zest for expansion and growing taxpayer discontent. Looking at the month of September, total non-federal government employment is down 2.8 percent since 2014; during the same period of time, private sector employment is down eight (8) (ocho) (acht) (åtta) (kahteksan) percent. There is, in other words, still an imbalance in employment trends between government and the private sector. Our government workers also remain well paid: we have the fifth highest compensation-of-employee disparity between government and the private sector. 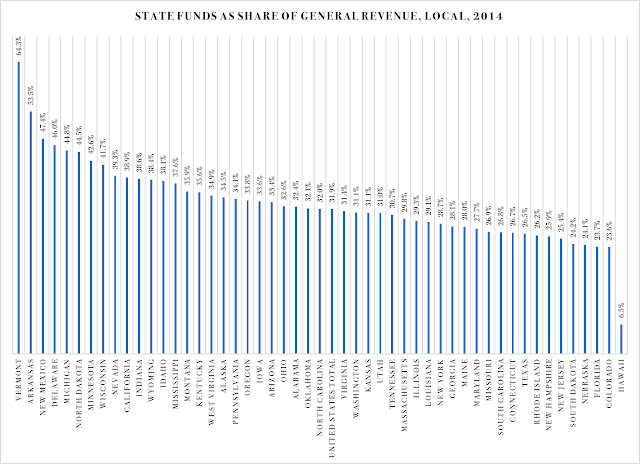 With the state paying for 38.1 percent of all spending that local governments do, the obvious question is: how dependent should cities, counties, school districts and other local governments be on the state? When do local governments cease to be independent entities and become spending agencies for the state? Mary Throne's idea appears to be that local governments should not have to come to the state "hat-in-hand" and beg for money. That, on the other hand, raises another question: what should be the state's policy? Should the legislature simply write a blank check to local governments? This is not a trivial issue. There are two aspects to it, the first being the very dependency itself. 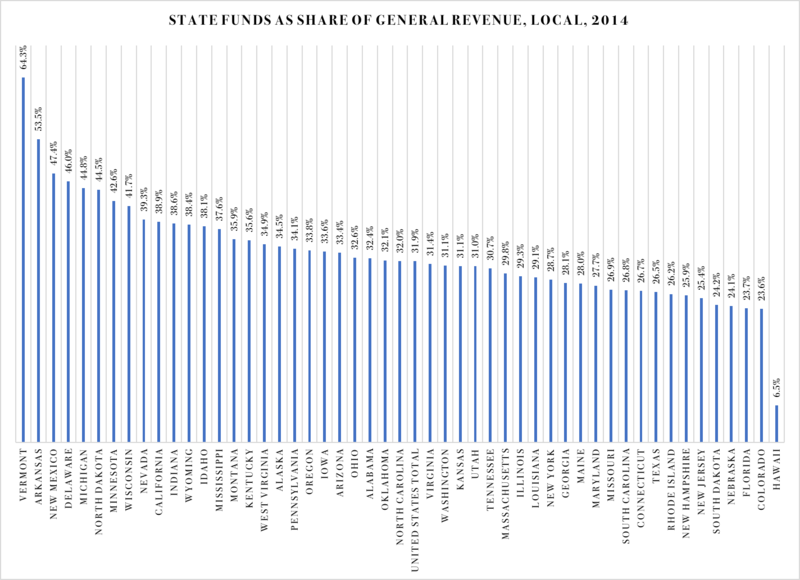 The more money a town or a school district takes from the state, the more dependent that local government becomes on the ups and downs in the overall state economy. If, for example, there is a downturn in coal production, and the state has to cut spending across the board, it will affect all local governments equally. A town far away from the coal mines, not directly hit by that downturn, will feel the same pinch as everyone else. With more fiscal independence they could shield their local community, instead of exacerbating and multiplying the downturn through the loss of state funds. The other aspect is the accountability issue. State funds come with strings attached, which in turn define how the recipients of those funds shall spend their money. If voters are unhappy with how a county, a city or a school district spend their money, what legislative body do they turn to? The county council will shrug their shoulders and say "we get so-and-so much in state funds and we have to do this-and-that to keep that money coming." The state representative, on the other hand, will shrug his shoulders and say "we just send them the money - they are the ones responsible for spending it." There is yet one more angle worth mentioning. With blurred accountability, and inter-governmental funds with strings attached, government spending tends to take on a life of its own. This, in turn, becomes a budget problem, especially when there is a serious decline in tax revenue. With government spending seemingly on autopilot, our elected officials generally shy away from trying to cut it. Instead, they frantically try to squeeze more money out of their tax base. What does this look like in reality? About half-a-billion dollars in proposed tax hikes. In other words, if Mary Throne is not careful, she will end up promoting and perpetuating the very structural problems that have brought our state's economy, and our state government's finances, to where they are today. With more auto-piloted spending, more government-as-usual and more tax hikes, Wyoming can only go one way. I don't think Throne wants that anymore than the rest of us do. I have no hope that she will change her mind, though, Democrat as she is. Hopefully, a Republican will emerge who is ready to pursue bold, visionary and growth-generating structural reforms to our oversized government.